Dorjee Tsering, a 16-year-old has burned himself on Feb 29 morning and succumbed to his burn injuries today. 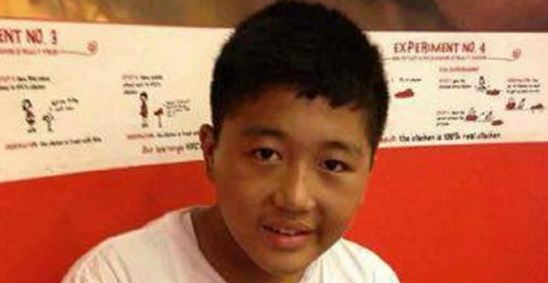 (TibetanReview.net, Mar03’16) – An exile Tibetan school boy in India has burned himself on Feb 29 morning in order, he has said, to draw attention to the plight of Tibetans under China’s occupation rule. Dorjee Tsering, a 16-year-old class X boy, is said to have suffered a 95 percent burn which covered his whole body except his face. He has shouted for a free Tibet as he burned. Dorjee succumbed to his burn injuries today at 8.40pm today. The boy, a student of the Tibetan Homes Foundation school, Mussoorie, and whose parents live in Manali, was reported to have torched himself at the home for the elderly in Doegu-Yugyalling Tibetan settlement in Herbertpur, near Dehradun, where his uncle lives, at around 8:30 AM. He was apparently visiting his uncle with his mother who suffered burns on both her hands while trying to put out the flames by shouting for help and dragging him under a tap. The ambulance took six hours to reach hospital. The boy is said to be the youngest of five siblings. He was reported to have indicated his intention to his mother on phone in September last year, asking her if setting himself on fire for the Tibetan cause would make her proud. But his mother, Nyima Yangzom, 59, berated him severely for entertaining any such thought, telling him there were many other ways to serve Tibet after his study. She even threatened to kill herself before he did, which prompted him to apologize and to assure her that he would do no such thing. However, he was later reported to have said the same thing to his father. Nevertheless, both the parents did not consider it likely that such a young boy will, in seriousness, carry out any such action. “I wanted to do something for my country and I figured that I can’t do much through studies,” the mother has quoted her son as having said earlier, speaking to a family member at Safdurjung Hospital, as reported by indianexpress.com Mar 2.